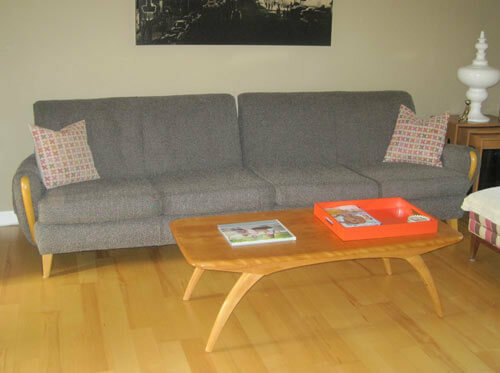 Pam’s August 2011 story about places to buy an affordable mid century modern style sofa continues to be one of the most popular stories on the blog. And good news — in the year and half since this first story, there are even more, affordable mid century modern style sofas that are available for sale. The mid mod madness is as mad as ever! Pam asked me to go “online shopping” to help out all the readers looking for sleek sofas — so here is your 2013 update. This story took me two full days — I dug deep — and found 240 mid century styled sofas, for sale at 33 companies. That’s a lot of sofas! In fact, I am pretty much dizzy with sofas dancing in my head. We defined “affordable” as less than $2,000. Some of these are more “modern” than “mid century modern”. We gave some latitude. Our research is fundamentally about aesthetics and price — we did not broach issues of comfort or durability and how all these issues dial up to “value”. You’re gonna need to your own research to make these determinations, including checking warranty and return policies. While we do get comments here, I am not sure they are in great enough volume to be considered “statistically accurate”. Another place to look might be: Manufacturers’ own websites; Pam says she likes it when they are transparent about letting folks post reviews right on those sites. We’ve also tried to include all the mid century sofas available from each company. Remember, if you want a fantastic sofa cheap — shop vintage. Many sofas back in the day were built like tanks. However, if you need to reupholster, that can get very expensive very quickly. 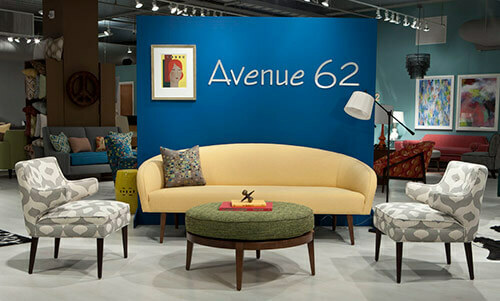 Younger Furniture’s new line — Avenue 62 — has some great mid century inspired sofas, including one of my favorites — the Lewis — above. Pam’s favorite — the Lily sofa (above in gray) is the first sofa she would look at if she were on the market for a sofa today. As Gavin pointed out on Pam’s original post about Younger, the Lilly is very similar to original Dunbar designs. In fact — Younger Furniture has quite a few mid century styled sofas that are also available in quite a selection of colors — from brights to neutrals. This one is new to the list — for good reason. 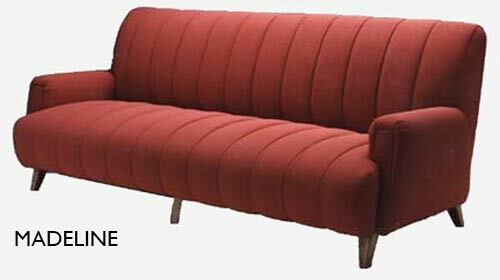 Thrive Home Furnishings has a great selection of mid century modern sofas that are designed and made in the USA. They even source American-made raw materials for their sofas. Most sofas are priced between $1,349 – $1,899 and are available in several era appropriate fabric color choices as well as with two different stain options for the legs. 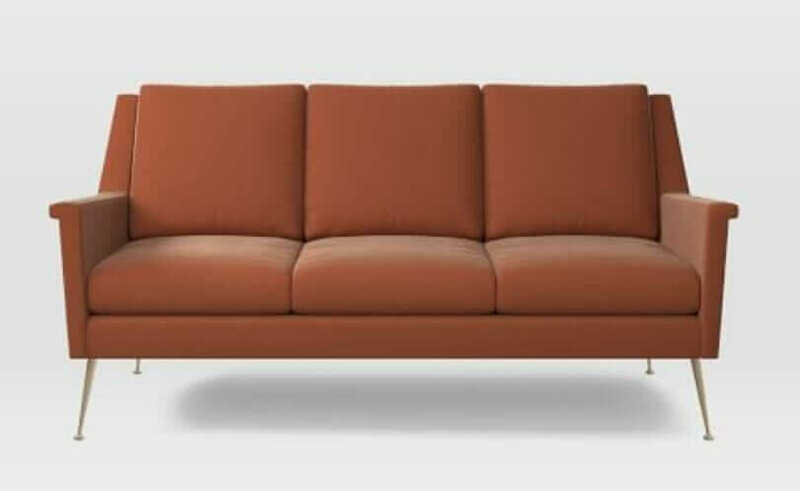 If you are willing to spend a little more — $2,500 — their Cleveland sofa looks very similar to the gondola style sofas that so many people are so crazy about. Although Macy’s seems to have discontinued the popular Corona style sofa — their replacement — the Clare — seems to be a pretty close match. The sofa is stylish and inexpensive. There are four other good mid century options available — see below. Most of these styles seem to be on a continual sale for $699. A reader also suggests that if you get a Macy’s card same day, you get another 15% discount — also watch for tax-free sales events. Mid century modern style sofas and loveseats from Macys. During a visit to Rejuvenation Lighting several years ago, Pam spotted this line of furniture for sale in their large showroom. It’s Castellano Custom Furniture — made right in Portland, and it sure appeared to be the real deal. They have a few mid century options on their website — but you’d have to contact them or visit a showroom to see what else they might have to offer. Though we aren’t sure it really hits under $2,000, we’re keeping it on the list anyway, it’s probably in the range. Modern sofa from Castellano Custom Furniture. Above, Gracie sofa by Perch Furniture. Based in Portland (there is a bird in their logo tee hee), workshop in LA. These guys get double extra bonus points for rockin’ the orange. Also available are the three other mid century-esque styles below. 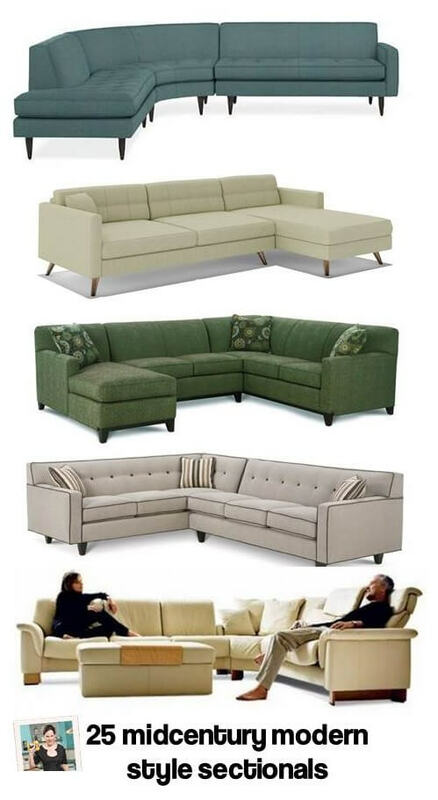 There are several good mid century styled sofa options from this company — though I excluded a few more options that were not available online because they didn’t have a listed price. The Cara sofa by Mitchell Gold + Bob Williams shown above is my favorite of the bunch — lovely looking — and it is listed at $1,895. I did find several online options between $1,325 and $2,000 — shown below. The Duncan (above) is just one of least 12 sofas from Rowe Furniture that could look beautiful in our mid century interiors. Even more, really — a lot of their line has what I’d call “modern-to-traditional” styling, meaning they are very versatile and come in a rainbow of colors. Easy-to-use website. Prices are not listed — but I’m guessing they would fit in our $2K and under budget. Mid century style couches by Rowe. Room & Board has a large variety of mid century sofas under $2K — such as my personal favorite — the Reese above. Not only are there 15 styles to choose from in this price point — but each style also has several color options — from neutrals to colors that work well with mid century decor. Mid century and modern sofas by Room and Board. The sofas at Lee Industries tend much more toward traditional and even wonderful mid-\ century modest. The Lee page is fun to look at — so many shapes and sizes — but no prices listed. Sofas by Lee Industries. There are 16 choices from Lazar Industries — ranging from modern to mid century modern — including my favorite, the Paramount above — all made in the U.S.A. Mid century and modern style sofas from Lazar Industries. 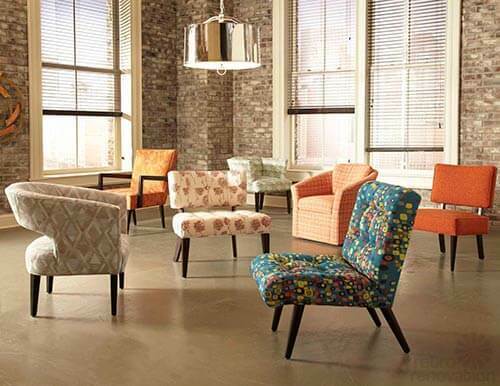 Reader Gavin served up Sofa Craft, now known as Monarch Sofas, a third-generation family-owned company with showrooms in California and Texas. Some nice looking sofas at great prices, here, and Gavin says, “Made in USA, good prices, foam or down, choice of springs and best yet: A Warranty!” Above: The Eva. 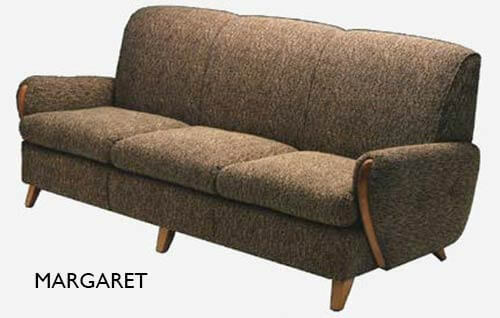 Mid century style sofas from Sofa Craft/Monarch Sofas. There are some *possibilities* in this collection by Michael Weiss for Vanguard. One thing to consider and check for, on all the sofas that I show, is their size and scale. Back in the day, sofas were not 40″ deep — oversized — the way they often are today. Some of these sofas are more less-deep and less-high than others — more “authentically” proportioned for smaller mid century rooms with lower ceilings. Mid century = long, low, horizontal lines. On the other hand, deep sofas can be very comfortable if you are tall or large and also if you like to hunker down to watch TV. So — thinking about the proportion of the sofa to your space, vetted with how you will realistically use it, is the task. I’m going to guess that the sofas in this Vanguard line come in under $2,000 if you don’t go too crazy with the upholstery. Michael Weiss mid century style sofas for Vanguard. Gus Modern has a lot of mid century modern sofa styles — they seem to be going after this market pretty aggressively. You got your numerous choices from West Elm. Don’t forget to check Ethan Allen. Crate & Barrel gets in, with their Petrie Sofa. Petrie sofa from Crate and Barrel. The lines of CB2’s Avec are too forced for me, but it seems to have its fans. Avec sofa from CB2. The offerings at Plummers, Dania and Scandinavian Designs seem to be identical — as are the websites. That’s because they are all brands run by the same company — and all are made right here in the USA. We first heard about Plummers from Tikimama — who spotted this Paramount sofa. Pottery Barn has a few options that might work — like the Landon sofa above. Ikea has several affordable sofa options for mid century modern living rooms. I’ve only ever owned a Klippan — which was firm but comfortable, though a bit short for cat naps. It held up well, and I sold it because I wanted a larger couch for my tiny living room and didn’t have room to keep both. I’ve heard good things about the Karlstad sofa, but have never sat on one myself. To be sure, their products are generally inexpensive. The Kivik sofa, above, is $649. In regard to buying a sofa, I’d generally counsel to buy the best you can possibly afford — aim to own it a lifetime, even. If you’re considering the cheap and cheerful route, take a look at Urban Outfitters. They have several mid century styled small scale sofas — some of which are even convertible — all of which are inexpensive ranging from $399-$649. Based in Winnipeg, EQ3 was founded in 2001 with the goal of offering more modern furniture to the North American market. EQ3 sells a wide variety of mid century modern sofa styles — all of which can be customized with fabric and leg choices they offer. My favorite is the Byrd sofa shown above — which retails for $1,099. Here’s the True Modern Luna sofa, with its Danish Modern legs — available in several configurations, each of their mid mod sofa styles can be customized to fit your needs. Check out this company’s Sample Sale area, too. Mid Century Sofas from True Modern Furniture. Blu Dot has a few options. Pam says that she does not approve of the name of this sofa. Mid century modern sofas by Blu Dot. After Pam’s original story, reader Kurt suggested the “Florence Knoll” knockoff from White on White — the Oslo — shown above. At 57″ wide, I’d not quite call this a sofa, but it makes the list because it’s nice to see new, smaller companies. It seems they have added a few more offerings to the list. See all the mid century modern sofas at White on White. On our last sofa round up — a reader commented that Z Gallerie had a few mid century modern sofa options — including the Vapor above. Funky Sofa pretty much offers what the name suggests — brightly colored unusual sofa choices. A few of their offerings would feel right at home in a mid century modern space — specifically the Mid Century sofa above. The sofas are made in the USA in Orange County, Calif.
Palliser’s selection of mid century modern sofas leans a bit more towards the contemporary — but they still offer a wide range of fabric choices and several styles that would work in a mid century setting. These sofas are made in North America — in one of the company’s two plants in Winnipeg, Canada or Saltillo, Mexico. Lexington also has a few options for mid century modern sofas. Hey, do not be forgetting, you can STILL get Heywood-Wakefield sofas — NEW. Yes, they are still being manufactured, by a company that bought the rights. That’s the Margaret, above — and two more options below. Heywood-Wakefield sofas still made today. Thanks to a tip from reader Wendy, we discovered Futurama Furniture — a small furniture company that has been making affordable midcentury style sofas using the same old school tried and true fabrication techniques and materials that were used to make the originals. Futurama’s founder Jeffrey Perry started the company in 1986 to fill a niche he saw in the market and is one of the pioneers that returned midcentury style furnishings to the market. Joybird Furniture is a relative newcomer to the midcentury furniture market, offering many styles of affordably priced sofas in a rainbow of colors. Joybird keeps their costs down because they are a ‘manutailer’ meaning they both manufacture and sell their products, which helps them to cut out the middleman and keep prices low. So far, their sofas have been getting good reviews. Thanks, readers, for your continuing help in making this the #1 most conclusive list of midcentury modern style sofas in the U.S. interior design blog world. If you find more manufacturers — let me know via the Comments. 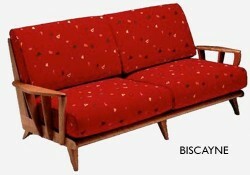 How about a post on midcentury sleeper sofas? :-). I like to have a good option for guests. We have had the CB2 Flex in the orange color for some time. As a bed it is great–large and pretty firm. Sometimes I like sleeping on it instead of our bed. As a sofa, however, it is VERY hard, and quite low to the ground, which I can tolerate with big pillows, because aim short, but my big & tall boyfriend finds very uncomfortable and it hurts his back. It’s a love/hate, and if it were just me living here, I wouldn’t be on this website, looking at sofas. Not sure when we will get to this. I was on Joybird (disclosure: an advertiser)’s website the other day and noticed they had sleepers…. incredibly useful , thank you! We have beautiful mid-century modern pieces, including our Arden and Slope Arm sofas, chairs and sectionals. All made in our factory in NC.